This large, elegant and highly collectible Green Zebra Marble Gemstone Egg was mined, sculpted and richly polished by hand to a high gloss finish in Pakistan � the only place on earth where Green Zebra Marble is found. Highly sought after by both beginning and serious gemstone egg collectors and home decorators alike, it is an excellent example of this how this lovely, semi-precious gemstone grows deep within Mother Earth. The beautiful crystalline structure of this egg is comprised of a dark, khaki green background with hunter green fragmented (brecciated) inclusions and white speckled inclusions and veining on one side (pictured) and the same colors and patterning on the reverse - only with some slightly larger hunter green brecciated inclusions. 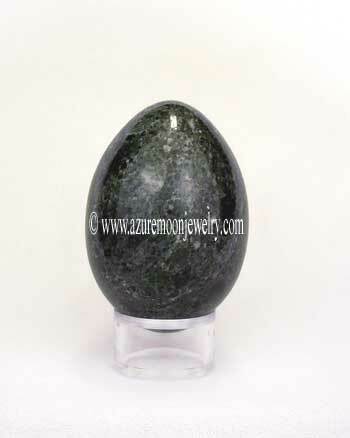 All of which make this marvelous Green Zebra Marble Gemstone Egg truly one of a kind. Honestly, the photograph just doesn't due this Green Zebra Marble Gemstone Egg justice! The fine crystalline structure and minute details that are visible to the naked eye are very difficult to capture in a photograph - it has to be seen in person to be truly appreciated! And to the untrained eye, the veining may look like fractures within the stone, but they are actually caused by the natural shift that occured within the Limestone during its natural growth process. This delightful Green Zebra Marble Gemstone Egg will certainly make an impressive and beautiful addition to any new or existing gemstone egg collection, as well as a wonderful Easter, or spring time display, fabulous kitchen decor, or a thoughtful and sure to be treasured unique gift! And remember - gemstone eggs are perfect for use in crystal healing, chakra therapy, meditation and therapeutic massage too! 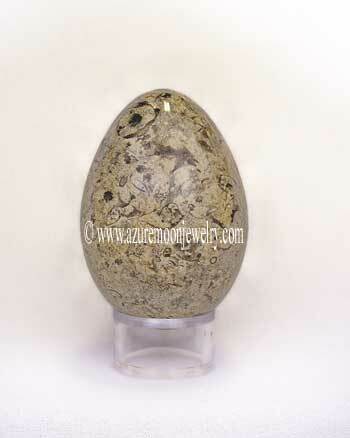 This Green Zebra Marble Gemstone Egg is the size of a duck's egg and measures approximately 2 7/8� L - 2� W and weighs 238 grams or 1190 carats. The crystal clear acrylic display stand is included. Please note that this is a 100% natural, polished Green Zebra Marble Gemstone Egg with natural veining, as well as some small natural flaws and inclusions that occurred during the Marble's growth process which add interesting and unique characteristics to the gemstone. Said veining, natural flaws and inclusions are not considered a defect, but rather a characteristic of the natural beauty and wonder of the earth's geology. Green Zebra Marble is a brecciated and metamorphosed Limestone in the form of a coarse to medium-grained rock of re-crystallized Dolomite or Calcite that is found only in the mountains of Pakistan. Metaphysical Properties: Green Zebra Marble, as well as all the colors of Marble, are used to provide for both clarity and suspension in states of meditation, including tantric activities. It promotes peak states of meditation and total recall of dreams, in addition to producing a nurturing instinct. Marble can enhance good common sense in matter of the home, the heart and ones sustenance. It also provides for strength of character and is also a �stone to provide protection� � both physical and emotional. Click here to learn more about the lore and metaphysical properties of Green Zebra Marble and other popular gemstones.